So…now that we’ve made our bias tape, it’s time to apply it. I’ll be using one of our Card Caddies for this demonstration. It’s small enough to get the entire project in the picture AND it has two curved corners AND two 90 degree corners, which is perfect this tutorial since my goal is to show you how to cover this entire perimeter with one continuous piece of bias tape! So let’s get started! 1- Begin by folding one end over diagonally (wrong sides together). Now align the free bias tape edge with the raw edge of your project, heading toward the first 90 degree corner. Carefully put a little tick mark on your fabric edge EXACTLY 1/4″ from the corner edge. Stitch 1/4″ from edges beginning at the folded over end and stopping EXACTLY at the 1/4″ tick mark you made. 2. Next, pull the bias tape straight UP, then…..
4- Beginning at top right corner edge, stitch 1/4″ from edges around bottom of project and up left edge stopping precisely at the tick mark you made in the upper left corner of your project. Now pull remaining loose bias tape straight to the left, then fold it back again so that the folded edge is exactly even with the left side edge of your project. Pin place so until bias tap overlapping the diagonal edged starting point by about 1″. 5- Now stitch straight across top edge stopping at the end of your bias tape. DO NOT stitch into the folded bias tape at the 1st 90-degree corner. 7- It’s a simple matter to just fold the side edge over into a neat mitered corner. Check out the closeup below. As long as you’ve marked your tick marks EXACTLY 1/4″ from the raw edge and stopped stitching PRECISELY at the tick mark, the mitered edge almost forms itself! 8- Now you can continue pinning your bias tape in place thru the curved areas. There’s quite a bit of layering in this section, so you may find that you have to “roll-out” a bit of your 3/8″-1/2″ pressed fold in order to cover your stitching, but that’s why its there, right? And here’s the final result… no bumps, no lumps, no ripples and PERFECTLY mitered corners! And the best part was… It was SO EASY! And now… it’s YOUR Turn!! Do yo have any questions about making your own bias tape in general? And do you think you might be inclined to try making your OWN bias tape the next time the occasion arises? And don’t forget, we actually LOVE questions and comments too, so if you’d like to share yours, please feel free to do so the section provided below! And if you enjoyed this post, please feel free to share it via FaceBook or Twitter! 20 Comments So Far, You're Next! Great post! I really needed this techinique because bias tape was always a challenge for me. I hate it! Bias tape techniques really aren’t taught in too many places so this is not a surprise. I hear this response from a LOT of people but if you try it this way, I think your opinion will change! In the very last photo, what is the purpose of the second row of stitching on the right hand side, inside the binding and close to the cards? This was the best, as I always ironed both sides, this is so easy, fast and wonderful. Thanks. As I ironed both sides, could this be the reason that when I sew the corner seams that on the back side I miss the seams and I have to resew to secure, then I have ugly looking corners? Help. thanks, I will try that the next time. That was the easiest I have ever seen ! I won’t be wrestling with those corners anymore . Thanks ! I love your bias tape tutorial. Thanks so much for putting it together for us. As a side note, do you have an edge joining foot? Your stitching will be incredible looking on the edges of your bias tape. It’s one foot I can’t live without. Try one, you’ll fall in love. An edge joining foot has a flange down the center of the foot. Place the edge of your binding right against the flange and then move your needle over to the right a bit. Depending on the thickness of the fabric, it can be any where from 1.5 to 3.0 from the center. Then when you stitch, the stitch line is exactly parallel to the edge of the binding….and you can get REALLY close to the edge of your binding. No web site anymore as I closed my purse business!! 🙁 I wish I had seen this BEFORE I did my first Wrapsody a few days ago! But my main problem is, I always hand-sew the second side (after you stitch and then turn over the tape) because I don’t like how the stitching looks when it’s machine stitched through all the layers. (Does that make sense?) It never looks nice and straight and right on the edge of the tape where it’s supposed to be. Thank you for the info-I will definitely be using your method when I apply my bias edge! How wide do you make your strips for your bias tape? I seem to make mine too wide and then I can’t line up both top and bottom. Good question Rosemarie, but you know it all depends on how thick the seam is that your trying to tape. As a general rule though, I make mine about 1.5″ wide and then press over ~3/8″ on one side… this way when I have a little extra to “roll out” is necessary for proper coverage. Does that make sense? Thanks Kat, your’e the bomb! You always make instructions so easy to follow. 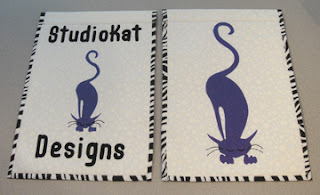 After binding who knows how many StudioKat designs by hand, I think I will try this machine binding next. I wll force myself to PIN and mark 1/4 inches on the turns. Fortunately I live in quilting country . I do not have trouble with the workers in these stores. There are dirty and poorly staffed. Waiting is incessant. Only go there as a last resort. Fabric is pitiful.